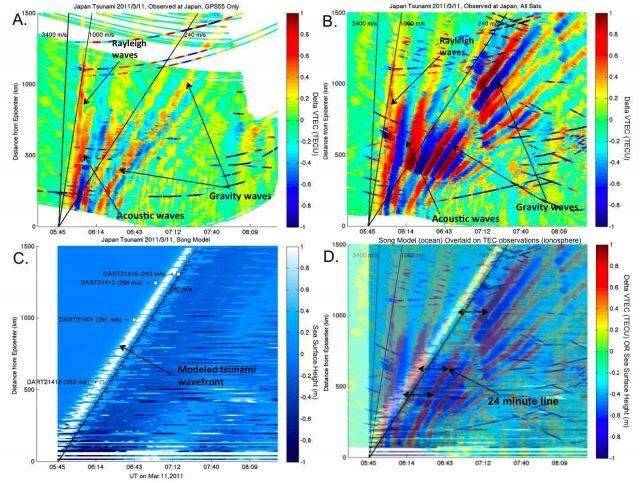 Travel-time plots of observed ionospheric perturbations and modeled ocean tsunami within 1,500 km (932 miles) of earthquake’s epicenter NASA/JPL-CaltechThe 9.0 earthquake and tsunami that devastated northeastern Japan in March 2011 did more than rattle the ground and upheave the ocean. Shock waves also rippled all the way up through the ionosphere—the upper atmosphere stretching ~50-500 miles above Earth’s surface. That motion was observed in the signals between GPS satellites and a dense network of ground receivers around Japan, reports NASA. The video explains these observations, never before seen in so much detail for a quake and tsunami of this size.